The cult of hanging dogs to unconsciousness, firmly established in K9 units of the military and paramilitary (police and sheriffs and some "dog training" academies) is generally hidden from the public, and the perpetrators deny doing it. There is also kicking, 'helicoptering' slamming to the ground, and electro-shocking. On the rare occasions when the brutality is exposed, it's passed off as "training." But I learned a secret in my years working in law enforcement, that this torture is, in fact, a manifestation of sick, twisted minds and is carried out for the purpose of macho posturing, showing off, and temper tantrums, and has little to do with actual training. I frequently hear people say that this abuse must surely be a thing of the past, believing it's been stopped. That's good wishful thinking, but as you read this, it is still going on. If you care about these dogs, I would not recommend supporting K9 programs, nor being fooled by their public displays. And if you care about the welfare of your own dogs, do NOT drop them off for "training" at a school that you do not have thorough personal knowledge about (including their employees) or where practices are kept hidden. It is very unwise to leave animals with strangers. It's best to have them trained with you participating, and if anything shocks you, speak up, demand accountability, remove your trusting animals from any potential abuse, and bring light to the situation for the other animals that may be abused there. 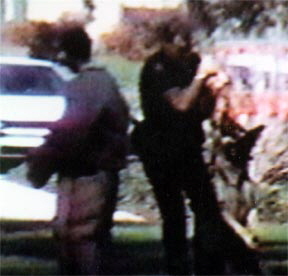 A VPD officer Jim Beautrow choking his K9 while dragging the dog in circles before slamming him to the ground. Source: Video documentation of incident.